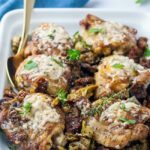 Full of the flavours of the sunny Mediterranean, this Baked Sun-dried Tomato and Artichoke Chicken features juicy chicken thighs with garlic, herbs, sun-dried tomatoes and artichoke hearts. A one-pot dish! Paleo without the cheese. Feeling Italian tonight? 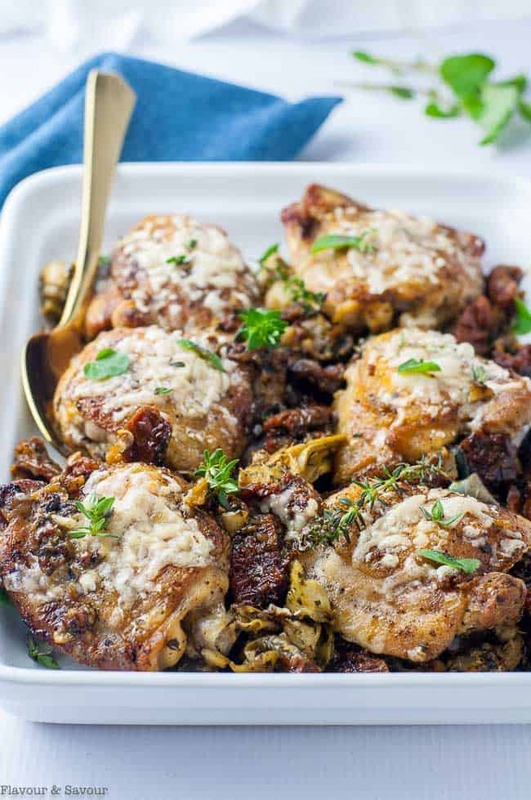 These chicken thighs with sun-dried tomatoes and artichoke hearts may be just what you need! 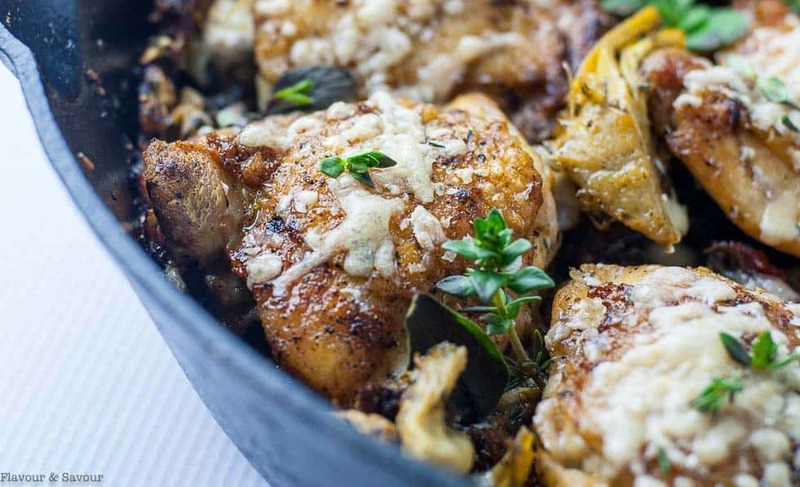 This one-pot chicken dinner will transport you from your kitchen table to the rolling hillsides and warm sunshine of Tuscany in one succulent bite. 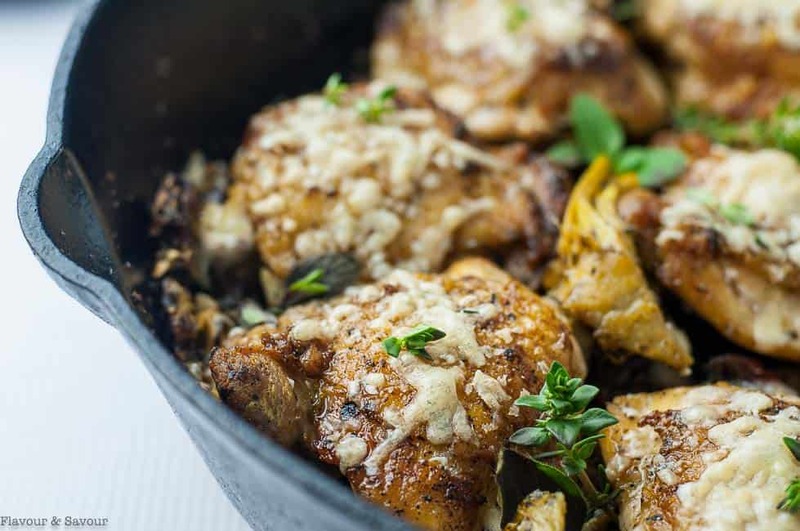 Garlic, wine, sun-dried tomatoes, artichokes, parmesan and fresh herbs: if that doesn’t make you feel like you’re under the Tuscan sun then I don’t know what will. 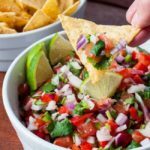 I originally published this recipe a couple of years ago, but it’s just so good that I’ve updated it with new photos and new information to answer questions from my readers. Enjoy! Crispy skin, juicy chicken, intense tomato and artichoke flavours and oh! Did I mention the cheese? 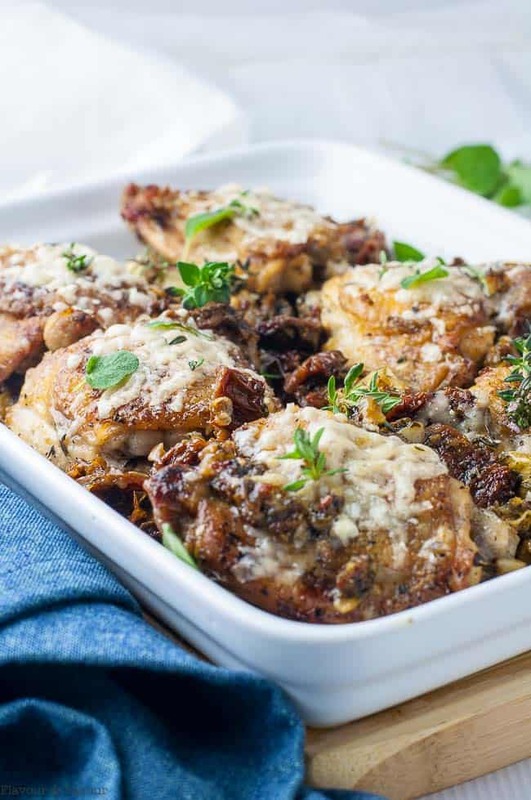 Melted gooey Parmesan cheese to smother it all and tie all the Mediterranean flavours together. Ah, that’s amoré. As always, I’m all about creating easy meals and this one is no exception. 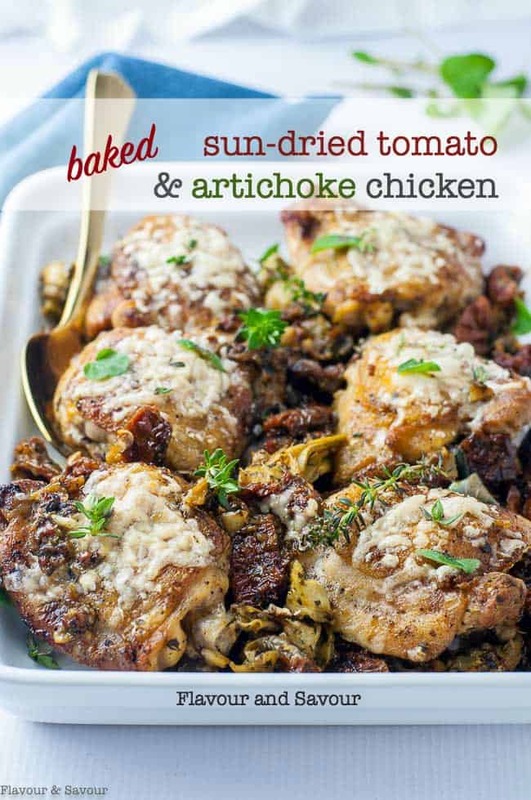 This Baked Sun-dried Tomato and Artichoke Chicken Thigh dish is an easy meal. Brown the chicken in a skillet. Remove it while you create the sauce with garlic, wine, broth, sun-dried tomatoes, artichokes and herbs. Put the chicken back in the same pot and bake it in the oven. Add some cheese and pop it back in the oven to melt. Can I use regular sun-dried tomatoes in this recipe? Yes, if you don’t have oil-packed sun-dried tomatoes, soak an equal amount of dried tomatoes in water until softened, drain, then slice and add to the pan. What should I serve with this chicken thigh dish? Make ahead and freeze for busy nights! 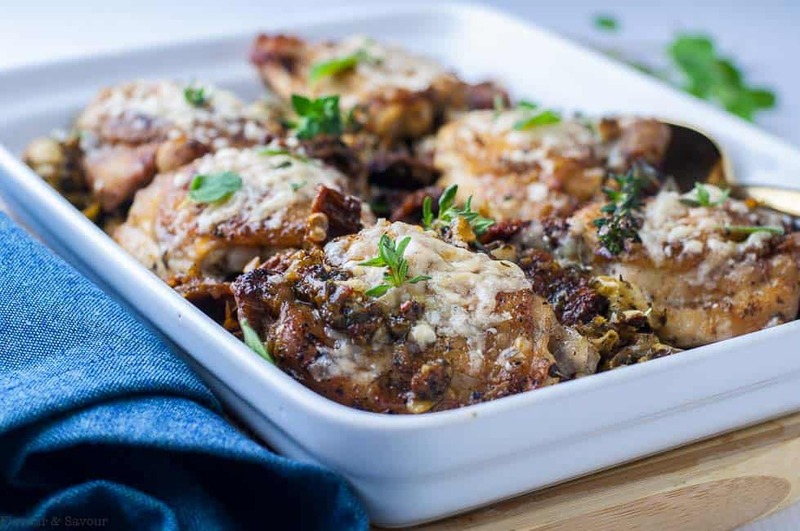 This Baked Sun-Dried Tomato and Artichoke Chicken features Mediterranean flavours of garlic, sun-dried tomatoes, artichoke hearts, and herbs. It's a one-pot dish! Pat chicken dry with paper towel. Sprinkle with sea salt and pepper. Heat oil in a heavy-bottomed oven-proof skillet over medium-high heat. Put the chicken in the pan, skin side down. Shake the pan just a little to prevent sticking. Cook on one side for 4-5 minutes or until lightly browned. Flip with tongs and brown on the other side for 3-4 minutes. Remove to a plate. Drain the excess oil. Add garlic cloves to the pan and cook, stirring until just starting to brown. Stir in chicken broth, white wine (optional), sun dried tomatoes, artichokes, thyme, oregano and basil. Continue to cook until liquid is reduced slightly, then add chicken back in. Transfer skillet to oven and bake for 30 minutes or until chicken has reached an internal temperature of 175°F. Remove from oven and sprinkle with grated Parmesan cheese. Return to oven for 5 -10 minutes or until cheese has melted and chicken has browned. 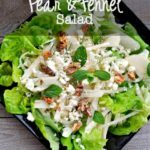 Serve with gluten-free pasta, or cauliflower rice or a hearty salad. This Glass Herb Keeper has paid for itself over and over! I never have to toss out slimy herbs. Keeps them fresh for days, and sometimes weeks! I use my cast iron fry pan almost daily. This page contains affiliate links. If you click on any of the affiliate links and make a purchase within a certain time frame, I’ll receive a small commission. The commission is paid by the third party, not by you. 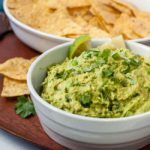 Funds earned simply help me to offset the costs of operating this blog and sharing recipes with you, my readers. 🙂 Make double for Monday. too! It was beyond expectations! Note to self: next time make sure the tomatoes are not exposed on top of the chicken when going into the oven. They started to burn a bit, but I just mixed them under about half way through when I realized this and it made no difference. I made heated cauliflower rice and since we had not had greens yet I spooned in some homemade dried chard flakes before heating. Thank you Elaine!!! I’m glad you liked it as much as we do! Like you, I’ve served it with cauliflower rice, but I’ve also made it with pasta for the kids. I used diced chicken breasts instead and adjusted the cooking time. This is one dish I’ll make again and again. Thanks for letting me know! 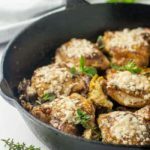 I’m always feeling like Italian for dinner, and chicken skillet dinners are a favorite! I’m dreaming of Italian food lately–we leave for Italy soon! How would you modify this for boneless and skin less thighs? Great question! While I haven’t tried it like that, I think it would be really good. 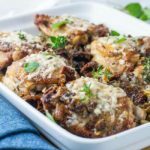 I’d follow the recipe instructions, but reduce the cooking time by searing for 3-4 minutes on each side, add the sauce ingredients as the recipe describes, then bake in the oven for just 15 to 20 minutes or until the chicken is cooked through. Add the parmesan on top, return to the oven to melt it quickly and serve. I’d love to hear how it turns out if you try it! Ohhh this looks delicious Elaine! 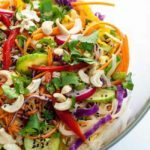 I love that it can be made paleo so easily as well. It’s on the menu this week and I’m excited to make it! Thanks for sharing! Thanks Lizzy! Hope you love it, too!